The no wave trailblazer suffered from throat cancer. Experimental composer and guitarist Glenn Branca died in his sleep on May 13 after suffering from throat cancer, his collaborator Reg Bloor confirms. Branca was 69 years old. Branca is known for an array of contributions to avant-garde and underground music, including his first project no wave band Theoretical Girls, introducing Lee Ranaldo to Thurston Moore and subsequently releasing the first two Sonic Youth albums on his label Neutral Records, performing with fellow pioneer Rhys Chatham, his instrument inventions like the mallet and harmonic guitars, and a whole host of experimental neo-classical, which he started composing in 1980. Your symphonic guitar explorations really resonated for me. Wilderness of mirrors bards their marks. The X Magazine benefit in 1979 was perhaps the most amazing series of concerts that I have ever seen. 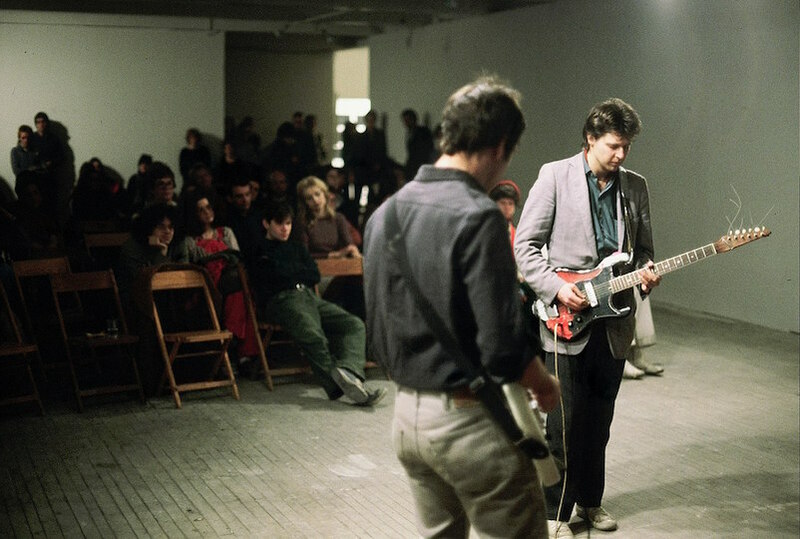 Glenn Branca, playing with Theoretical Girls was the best band in the program. It changed my life. Sorry I never had a chance to tell him. Image courtesy of Hallwalls’ archive.